Coro Fabrettino brings the beauty of Latin American culture alive with their lively performance of folkloric native Nicaraguan music. The choir maintains the cultural traditions of Northern Nicaragua by the retelling of stories and history through traditional song, dance, and music. The performance includes several audience participation numbers. We want your students to get to meet and work with the Coro Fabrettino kids. Depending on the length of time the group has at your school, the Nicaraguans will offer to your social studies, Spanish, and music classes singing and dancing workshops and/or classroom visits. In these visits, the performers will present and demonstrate fascinating aspects of their Nicaraguan culture (basket weaving, foods, local traditions, holiday celebrations, etc). 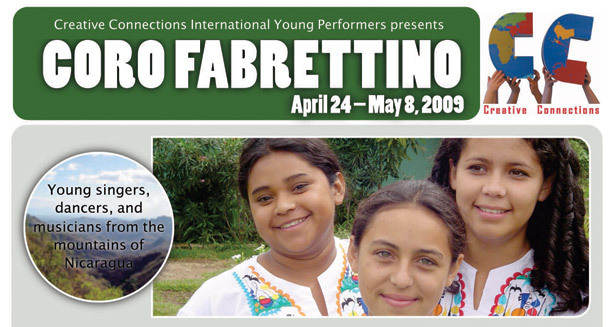 Coro Fabrettino is comprised of 14 boys and girls, aged 10-18. These children participate in the education, nutrition, and community health programs at the Fabretto Children’s Center in San Jose de Cusmapa, a rural village in the northern mountains of Nicaragua. Last summer, the group was the highlight of the ICAF’s World Children’s Festival in Washington, DC, performing at the Millennium Stage at the Kennedy Center.